This is for anyone who doesn’t believe in themselves. My childhood was complicated, but here’s the nutshell version; my parents were never together; my dad left early; and my biological mother was barley nineteen years old when she had me. I was adopted by my parents at the age of twelve. I recall a lot of runaway homes and finding myself in bad situations. Growing up with emptiness and the only form of love I knew was abandonment. The only way I was able to express my feelings as a young person was through sports and I was good at everything I played. I did it all from running track, to volleyball, sports became my outlet. I was raised as a small farm girl but I was a wild child at heart. I remember training within the last year and a half thinking, if only I had all this knowledge when I was younger, weight rooms, healthy relationships. What I’ve learned is this, “what if’s” get you no where. I know now you can’t change the past nor change anyone other than yourself, unless they’re ready. I would not have been ready for this chapter of my story had it come any other time in my life. This is something that has taken me a very long time to understand. At the end of January 2013 I tried to zip a XXL winter jacket up, and it wouldn’t zip. I was not upset of the fact it wouldn’t zip, I was upset at the thought of how expensive a new winter coat would be and said I refuse to spend the money on a new one. I remember getting on the scale at my heaviest, 285lbs, but I never weighed myself after that. I can tell you at one point even size 30 pants were tight! The same day I tried to zip the coat, Dr. Oz was on and he had Dr. Ian Smith as a guest talking about his book “Shred”. I told my ex, at the time we already were sleeping separate and just roommates going through life for the sake of what I call trying to survive, “I’m going to do this, and go to the gym after work from now on”. He really wanted nothing to do with what I was doing. In the 6 weeks I went through the book, I lost my first 22lbs! I’ll never forget, I could barely walk on the treadmill then one month later it was jogging. I started adding spin classes soon I was running and spinning every day. It was all I knew how to do. I learned slowly that eating is a significant part of the process. I never understood that until I read “Shred”. I started coming home from the gym at 1 in the morning, and found that I was too jacked to sleep. I became obsessed with Instagram, discovered ways to eat better, and thought maybe; just maybe I could actually lift those things called weights! I started interacting with people on Twitter. 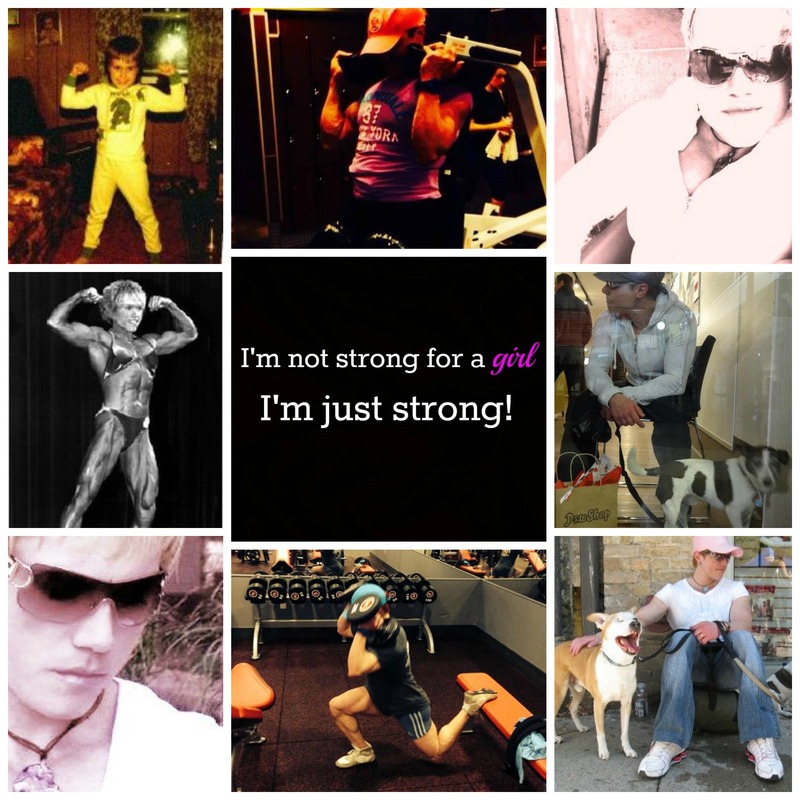 I met and saw some amazing women and men who were fit and strong. I have never had any real support in my life and felt misplaced in the world so for me to hear strangers supporting me via social media was hard to accept. I just didn’t get it. Just seven months into this process I had lost about 120lbs, left my ex-husband and took the kids to start a new and scary journey. There are two sides to every story, I left my husband because I was dying inside. I was always the girl with the laugh you could hear from outside, the smile that could light up the darkest room. My friend tried to help me leave many times. It is much easier said than done and I get this. For years when my ex would drink, he became a different belligerent man. As I became stronger and started believing in myself, I started feeling alive again. I could not stand living one more day the way we were living. With no idea, no money, no help only the faith I had in God to guide me, we started over. I prep my food every week. Normally it’s a whole organic chicken with a head of garlic, brown rice and a veggie (my favorite is acorn squash). When I need a change it’s either shrimp, turkey or bison. I have crazy goals I never thought possible for myself but it’s what drives me to be better than I was the day before. I’d love to compete in a bikini and I have plans to step on stage this August here at home. If I am not ready, there’s always next time. Shortly after my first year transformation, I was introduced to my coach, my rock, my angel as I call him Rob Renowned. He inspires me with his old school methods and has transformed my body completely with each week that goes by. #CoachRob to you I am grateful! I have three amazing and beautiful children. They are my best cheerleaders, my heart and soul. My son who is the youngest will never remember mommy fat, and I am grateful. The two youngest are my healthy eaters. My eldest has a hard time with the change but that is my fault. I was told once I was being selfish for leaving my ex-husband and losing all of my weight. I don’t believe that there is any truth to this. So don’t believe the outside world. (These people are just as unhappy in their life as I was in mine.) What’s truly amazing is the fact that their father and I are friends and we communicate pretty well. To date I have lost 145lbs. I am losing about 2lbs a week and of course I am only getting leaner to compete. My coach has me on a workout routine, and I have worked my way up to 400-500 squats 3 days a week, and I love it! I am grateful for the manager Andy at my gym in New Berlin, the Princeton Club and almost every teacher (especially Zachary) I have taken a class with. These individuals have helped me every single day. I’ll never forget the day I was in Zachary’s spin class and I actually started to cry. The person that I have become through this entire journey is simply, crazy, amazing and beautiful. Sometimes I don’t believe this is my life. I still don’t have much as far as material things, but let me just say this; a roof over my head, food on the table, my health and my babies are all that I need! Today, if you listen close, you can hear me laughing and if we were to meet (I promise) if your room is dark, I will light it up with my smile and my energy! Believe in yourself and great things will happen for you. Hello, my name is Michelle and I am excited to share my fitness journey as so much has changed since sharing my first story with Socially Fit. I’m from the beautiful islands of Trinidad and Tobago found in the far south of the Caribbean. 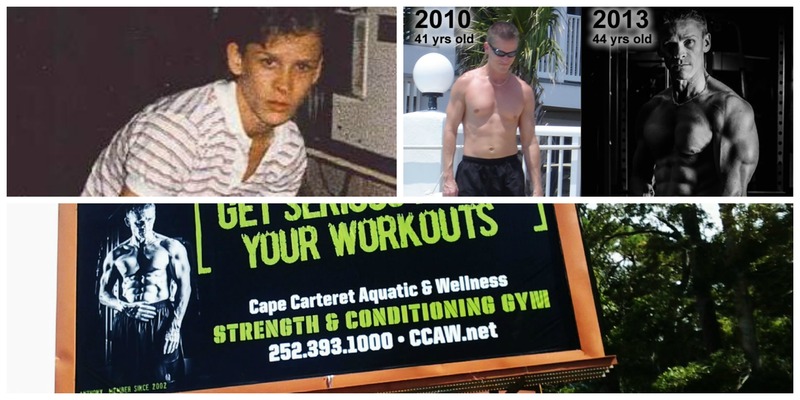 I began exercising at age 11 and never stopped unless told to do so. I was forced to stop working out in 2003 when I had a surgery. The other time was more recent, in 2013 after the birth of my miracle baby. Yes I said miracle baby since I was told that I was not capable of having children due to my diagnosis of endometriosis in 2003. I’m a figure athlete and have represented my country in various international body fitness competitions. My last competition being the Arnold Classic held in Ohio in 2013 where I placed 5th in my class. 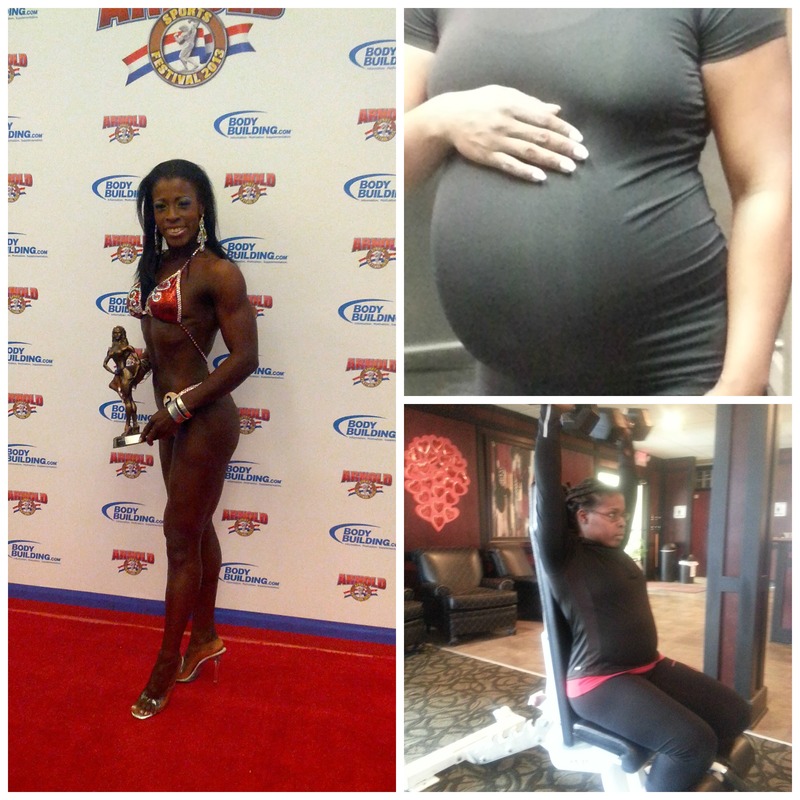 During my pregnancy I was able to exercise with some modifications as I went through each trimester. However I had an emergency C-section which slowed my return to exercising post pregnancy. It was recommended that I should not to work out for the first 6 weeks post pregnancy and that was the crucial time when my weight should be reduced. Instead I have only lost a minimal amount of weight and after two months began a training regimen. With the new addition to my family life, exercising has to be strategic. Timing is key. We purchased a treadmill for our home so I can get more structured cardio done when the baby is asleep. Weight training normally lasts between 30 to 40 minutes and is done prior to or after training clients as I am currently a freelance Personal Trainer in north Indianapolis area. I have set both short term and long term goals and they motivate me to everyday to wake up and accomplish the objective set out for the day, week or month ahead. For example I set out to complete a 30 minute cardio session at least 3 days a week as well as 4 to 5 days of weight training to build muscle. My nutrition has also become even more crucial thus food prep every Sunday has become the norm to allow me to ensure the proper meals are consumed daily. Some of my fitness goals include me being my original weight before I became pregnant on or before my birthday which is in July. I would also like to challenge myself by preparing to compete in October 2014 either representing my country Trinidad and Tobago or taking part in an NPC Show. My hubby and parents have always been and still are the best support system ever. Hearing my mom say, “I’m eating better and exercising to be healthier” is support and a great motivational tool for me. My favorite body part to work out is back. I have always loved the quick response my back muscles adapt to my exercise routines over the years and this time is no different. Always motivate yourself from within. Make mental notes and write down your goals. Mark Twain said it best, “the secret of getting ahead is getting started.” My last competition pic has been a continued motivational piece for me. I would love to earn my professional status one day. “One day at a time I am getting close to my goal” has been my mantra. It’s what I tell myself with each workout and each meal I consume each day. I’m very focused on building muscle while creating as little stress on my joints as possible. Always strict, controlled form. No bouncing. No swinging. Often (but not always): Slow reps (4sec down + 6 sec up) to shock the muscle and build up lactic acid releasing growth hormone. Drop sets, rest/pause and partial reps. Occasionally I will lift heavy weights, 3 sets of 5 reps or so. In the mid-80s, I was a 115-pound teenager and I saw a picture of Robby Robinson posing. I remember thinking “Good grief is that his bicep?” He was fantastic and I was inspired. Seeing Robby Robinson, Frank Zane, Tom Platz and others, they blew me away. I don’t have as many pains or some of the health problems that others my age have. I like to attribute this to staying healthy. Mentally, I love preparing for a workout, testing techniques and seeing how my body responds. It keeps me sharp. I love getting questions from others because then I usually have to do research before answering. I end up learning a lot that way. Looking at how others progress and transform themselves, I also want to be inspirational to others my age or even younger. If I’m doing it, they can too! I love encouraging others and watching them take the bull by the horns. My wife is fantastic! She’s my biggest supporter. She helps me eat healthy by eating healthy herself. She knows I’m not a fan of vegetables and she creatively adds them to the things she cooks. She is always encouraging me and telling me that I make her proud. She’s a wonderful woman and a blessing to my life! I also get much enjoyment out of the younger crowd. We’re fortunate enough to have a great group of young people at our gym and they’re always encouraging and inspiring! I like having a good time at the gym and we all get along great. Putting on weight has been one of my biggest obstacles. I was proud that I put on 18lbs. last year before cutting. That was the most I’ve ever weighed (178). I was also fortunate enough to have been interviewed by Bodybuilding.com. I was one of their Over 40 Amateurs of the week. My routines change all the time. I’m cutting at the moment, the techniques are the same basically, I might add a few additional exercises if I think a specific body part needs more attention. I’m doing a lot of isolation type exercises right now to bring out the small details as I cut. I am very big on the MIND/MUSCLE connection (Kai Greene talks about this a lot). It really works! I have a few goals I wish to achieve and there are many ways that I can go. Maybe personal training. Maybe a contest. But definitely to look at myself in the mirror and see improvement. My daily food plan consists of various combinations of the following: egg whites, 1 egg, oatmeal, tilapia, chicken breast, brown rice, tuna, broccoli, spinach, orange, apple and cottage cheese (casein protein). I also mix in supplements such as: Whey, BCAA’s, Creatine HCL, Yohimbe, Green Tea Extract, Fish Oil and Beta-Alanine. I’m a HUGE fan of positive reinforcement. It’s just a great tool! EVERYONE has something they can be proud of and you should find people that will recognize those things in you. Social media is a great avenue for that. Find positive people who are not just blowing smoke or trying to sell something and they WILL help you. Remember, if you don’t fail occasionally, you’re not pushing hard enough. Don’t be afraid to fail! Just get started, one step at a time. Set small goals leading to ONE big goal. Be proud, but don’t be satisfied. Take time to be pleased with the results of your hard work, but don’t be finished. Always look for something to improve. If you’re serious about progressing, you won’t have to look hard to find them. 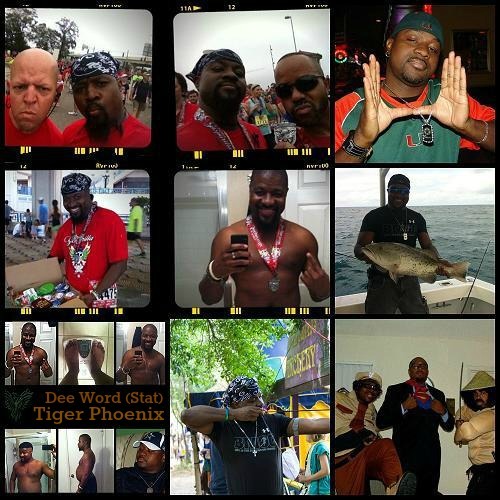 Since my last story approximately two years ago, I’ve rejoined the workforce, commuted to another county, my mother survived cancer, I’ve competed in a small bodybuilding show, sold my house and divorced. It’s been quite a journey. The competition in February 2013 was small and a lot of fun. I wasn’t the fittest competitor at the show, but I was the fittest ME. Just being strong enough and brave enough to get up on stage after having kids and several years of training and getting healthier was a victory in itself. I lost to my bodybuilding coaches, but no disappointment there. I did it for myself! I am planning to compete in Women’s Physique this summer in Venice Beach. Gorgeous plans, lots of fun and many friends will compete there. Again, I’ll be doing it just for myself. Free time and extra money are scarce these days, so one show is my only goal. My work/life/gym balance is currently far from ideal. I spend 3-4 hours commuting daily to my office in Orange County. I have my daughters every other week but hardly see them. My training is done whenever I can fit it in. Five days training per week is my goal, but fluctuates based upon travel times, the girl’s schedules, obligations, and a disturbing need for sleep. This is the area of my life that needs drastic improvement, but the bills must be paid! My primary goal is to find proper balance, spend as much quality time with my loved ones as possible and become as financially independent as I can without sacrificing my health, fitness or family time. For the past 4-6 months I’ve been lifting as heavy as possible and building strength and mass. My upper body and legs have grown and definitely reflect it. I focus on individual muscle groups during each training session, but do adore training chest with triceps and lats with biceps. I just started lowering the weight and am doing 20 minutes of some type of HIIT (High Intensity Interval Training) almost daily now that I am working on leaning out so the muscle definition really pops. I am very careful to keep the cardio moderate, my ultimate goal is burning fat without burning muscle mass. I want to keep the strength I’ve worked so hard to develop. While my nutrition is tighter now that I am working on getting leaner, I am much more loose with it than I used to be. I eyeball portions more often than weighing and measuring. Treats find their way in when I feel the need. I recently recalculated my macros and am playing around with 170 grams protein, 140 grams carbs and 40 grams fat daily. If I don’t see the results I’m aiming for, I’ll change it. No plan is so perfect that it cannot be improved upon. This isn’t a diet or a fad, it’s my lifestyle. It gets tweaked as my goals and needs change. I eat a lot of lean protein, complex carbs and healthy fats. Added sugar and processed foods are kept to bare minimums. I’ve been doing this long enough that it’s no longer habit, but second nature. 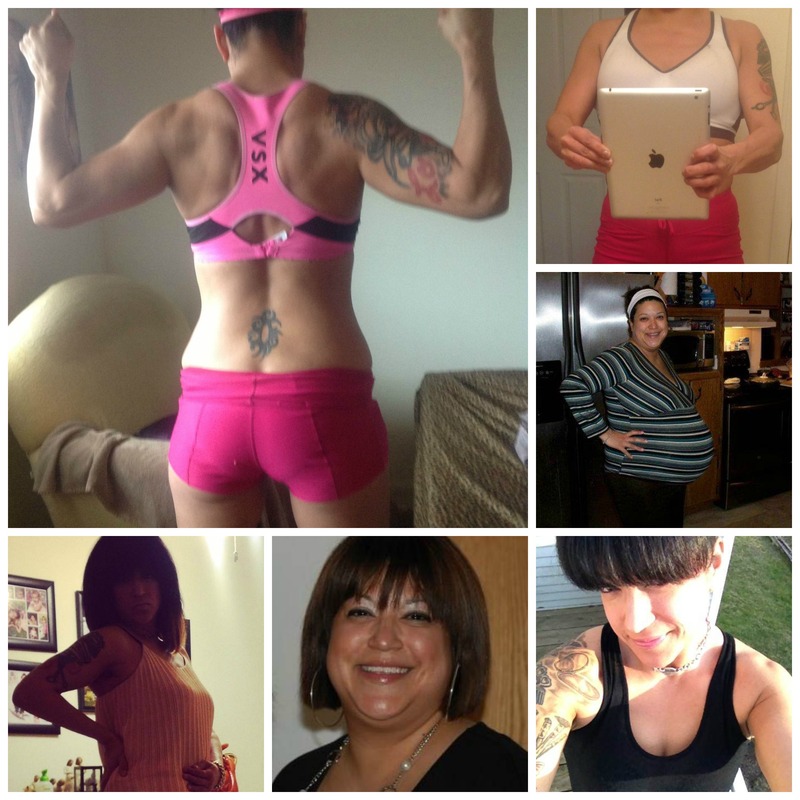 Getting started, overweight, after having two children and multiple abdominal surgeries was HARD. It was even more challenging to keep stepping into the gym when progress was slow, or seemed non-existent because I couldn’t see the changes happening fast enough for my liking. It seemed like all of the incredibly fit people I saw at my gym were born that way and found it an effortless process. I have never, ever forgotten how that felt. I know better now and my passion is to help motivate others to take that first step. Encourage them to keep putting one foot in front of the other. Small steps now lead to BIG changes later. The journey to health and fitness is a marathon, not a sprint. I want others to believe in their own inner strength and learn how to channel that into self-motivation. The past year has been the most challenging of my life. It’s also been the most rewarding. I’ve fully embraced my inner strength, further developed my outer strength and emerged with the clearest vision of just who I am and, more specifically, who I am not. I am perfectly imperfect and the people in my life who truly matter embrace me for who I am, not who they want me to be. I am grateful for each new day. Love and respect yourself first. Then allow others to. Love more. Train harder. Eat better. Dream bigger. Don’t compare yourself to others be the best possible YOU!